The ski season on the North Shore Mountains is off to a slower start this year than last, but as of Wednesday afternoon there's one more place to hit the slopes. Grouse Mountain celebrated a partial reopening at 3:30 p.m., welcoming skiers and snowboarders to its Paradise Bowl and Paradise Jib Park areas. The mountain is opening later than the last couple years – in 2017, its season started on Nov. 10 – but Grouse spokesperson Julia Grant said early December is within their usual window. "A typical time frame for us (is) in late November, early December," Grant told CTV News. Snowmaking crews have been hard at work getting runs ready since the mercury started dropping, and Grant said they will continue working to open up more terrain. "There's been some great cold temperatures recently," Grant said. "Our team has been out there, we've got all our snow guns firing, and they've been able to help us get open today." Cypress Mountain partially opened on Monday, but Seymour, which doesn't have a snowmaking crew, remains closed. Staff said they aren't sure when Seymour might open, but that mid-December is more common. 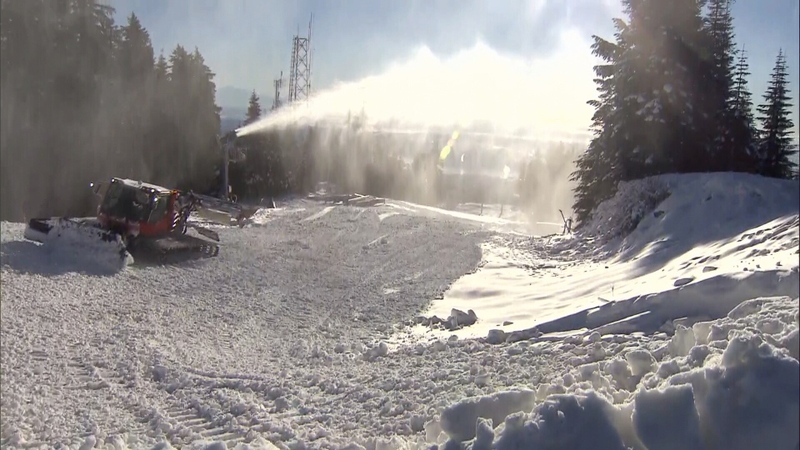 Snowmaking crews have been taking advantage of the colder weather to get Grouse Mountain ready for skiers. Dec. 5, 2018.